As one would expect, a strong, caring friendship developed over the course of the trek with our fabulous guide Hari and our constantly smiling porter Chhring. For some odd reason, it felt like fate. Like it was meant to be that we were paired together with them. Besides the immense beauty and magic of the Annapurnas, our Nepalese companions were equally amazing and they made our entire experience in Nepal truly remarkable. Hari is a bright, hilariously funny young man who is from the villages yet now lives in Kathmandu with his beautiful wife and young son. He is a wealth of information and every story is full of laughs and poignant remarks on Nepal (culture, politics, religion, education, business, etc). Over all my years of travel, I have never met someone quite as unique, personable and driven to satisfy his “customers” as Hari. He is unbelievably driven to help and ensure that every need be met. I was constantly surprised and even amazed by his non-stop attention to us. He was my link away from home (via his cell phone which oddly enough, worked in the middle of nowhere), our dealmaker (always calling ahead to the next village to reserve the best room at the best teahouse), our waiter (embarrassingly, he waited on us hand and foot, keeping everything running smoothly along the trek) and most importantly, our friend. We talked for hours on end about everything, sharing our lives, our history and our cultures. The highlight of the day was happy hour. Each night before dinner, we would meet in the teahouse and sit around the only heating element (a wood or yak dung-burning stove), and drink Belgium beer (Tubourg) and play cards (every time it was JACKS). We would howl with laughter as we played and get constant looks of curiosity from the other guests mostly because they did not interact like us with their guides. Most tourists join huge trekking companies of 10-20 trekkers, 10 porters and a couple guides. The guides help the guests order and usually sit at their table during meals, however, the porters all eat separately in an entirely different area. Thus in my opinion, you do not get the same kind of cultural immersion as you do with a small, personally guided trek and quite frankly, the cost was probably the same. Our evenings of cards, beers and meals were some of the highlights of the trip. It gave a whole different level of meaning to Nepal for me, and it is the way I like to travel: With the locals. Hari’s story is facinating and at first sounded very unique to me, however, is probably relatively common among young and talented Nepalese who want to get ahead. He grew up in a small village in the mountains of Nepal. His father was a postal worker, making barely enough money to get by. He had heard that being a porter was a good job so decided to give it a whirl. During one of his treks, he befriended a European couple who instantly became very fond of him. Over the years, the couple returned to Nepal several times, visited Hari’s father and family in the village, and most of all, they gave back. They provided money for Hari’s father to help his children’s education, and helped build infrastructure in their village. 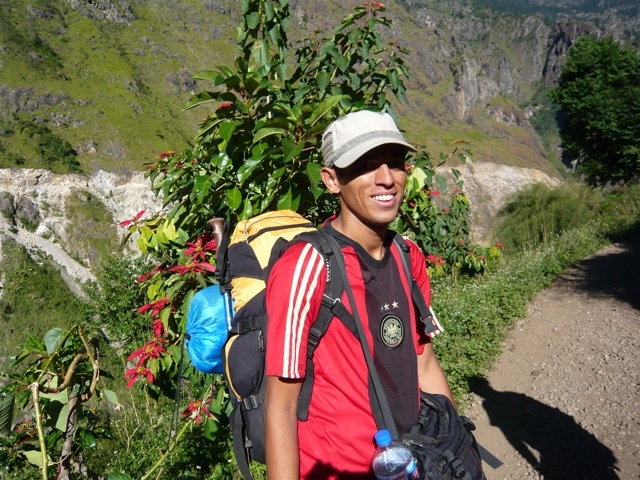 Hari was able to gain a good education and get ahead in Nepal, which is relatively hard. The literacy rate is under 50% mostly due to lack of schools in the villages (over 80% of the people in Nepal live in rural areas). Hari feels very fortunate that he has been able to get a degree and even more so, have the opportunity to work a few years in Dubai to earn some savings to start his very own cybercafe. Leaving Nepal is one of the only ways to get ahead and make money. Many Nepalese apply for jobs in Dubai, South Korea and other countries but few are lucky enough to get the visas. 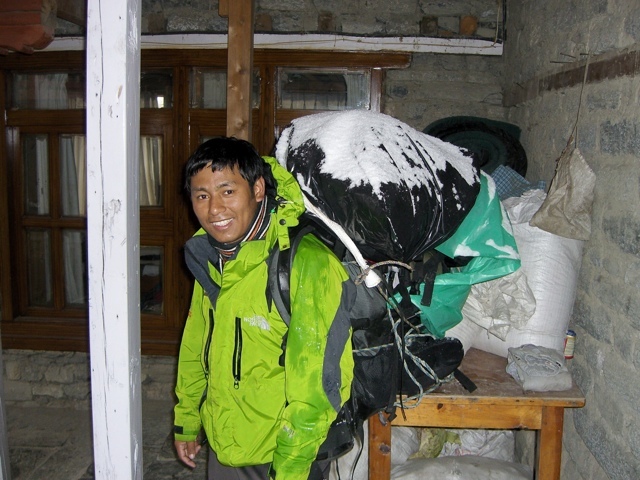 After Hari returned to Nepal, he followed in his father’s footsteps as a porter and worked his way up to being a guide. He currently splits his time spending half the year as a guide and the other half of the year helping his wife run their cybercafe in Kathmandu. His English is excellent as well as his business know-how, so I can see Hari going far in the world and truly hope he does. He is a charismatic, one-of-a-kind sort of guy. One that you cannot help but like and hope he fares well in life. The world could certainly use a few more people like Hari, that is for sure. Our porter, Chhring, is also a wonderful person and a treasure to have on our trek. Like Hari, Chhring is also from the villages but he is a Buddhist and still spends most of his uncorking time in the village where his wife and child live. Being a Buddhist, Chhring gave us a different perspective on life, religion and culture in Nepal. His English was ok (he is learning) so we had to use Hari to help translate. But hid kindness and tranquility didn’t need words. We were happy just having his smiling, peaceful presence. The work of a porter is much more difficult and labor-intensive than a guide. Most porters carry at least two backpacks of loads up to 100 pounds. The world-famous Sherpas, who are small in height but incredibly strong, carry up to 200 pounds and are basically paid per pound they can carry. As a Westerner, it was hard to see Chhring and the other porters carrying such big, heavy loads wearing rundown shoes and very basic outerwear. It wasn’t uncommon to see some Porters in ripped sneakers or even flip-flops! Yet for porters, the job was worth all the hassles of carrying heavy loads over mountainous terrain and being away from family for months on end. It offered a way out of poverty and a chance to earn some extra money for their village. We treated both Hari and Chhring with our uttermost respect, and as the trek went on, it felt more like they were our friends than our help. As I mentioned above, we spent much of our free time together playing cards, laughing and having fun. Near the end of the trek, we did a few special things for them as well such as purchasing Chhring a real pair of hiking boots and giving Hari some of the things we didn’t need anymore (thick, warm Nepali sweater, headlamp, etc). We also gave them a very nice gratuity in hopes that they would use the money to help them get ahead. It is always a struggle for us to know what the right thing to do is in these situations. When $100 to us means so little yet $100 to them means so much. But we feel we did the right thing. We spent our last night together in Pokhara, a beautiful lakeside town with a postcard perfect view of the Annapurna and tons of modern ammenities which felt like Heaven after so many days roughing it. It was the famous Festival of Lights where the entire country is on holiday, celebrating in the streets with music and dancing. The sidewalks are lined with candelight and it is truly magnificent. When asked what Hari and Chhring wanted to do to celebrate the successful finish of the hike, they chose to attend a cultural dinner and show. We spent the next two hours together, laughing, watching and finally dancing on stage to the diverse collection of Nepali songs and dance. It was a perfect way to end a perfect time together. I’ll never forget them! This is a very touching post and is just the way I like to travel and also to live as I’ve lived for years overseas both in Thailand and now in Guatemala. Nearly all my friends are locals and I prefer it that way and it’s really the only way to truly learn about a country, it’s culture and a language. Thanks for sharing.